Peter Epstein of Epstein Research talks with Robert Mintak, CEO of Standard Lithium, about his company’s projects in Arkansas. Robert Mintak, CEO of Standard Lithium Ltd. (SLL:TSX.V; STLHF:OTCQB), has two unconventional lithium projects in the U.S., one of which he believes is de-risked more than most lithium projects around the world due to infrastructure, permitting, jurisdiction and other key factors. While Robert can’t know for sure until the company releases a Preliminary Economic Assessment (PEA), it seems likely that cap-ex will be low compared to conventional brine projects. For reasons explained below, op-ex is likely to be in the bottom half of the industry cost curve. The company’s goal is to be in the bottom quartile. Please explain Standard Lithium to readers who are unfamiliar with your company. We are an integrated technology and specialty chemical company. We are listed on the TSX.V as a mining exploration company but we are not exploring, you won’t see any new mineral discovery announcements coming any time soon. Our business model is simple and somewhat unconventional compared to our peers; we believe the fastest way to go into production and to limit investor risk is to form strategic partnerships that allow us to piggyback off the existing infrastructure and investment of massive operating commercial brine assets in the USA. And, I know your team is incredibly important to you, can you talk about that? Our team is a small but very effective team of project builders. Myself, I have been involved in the lithium sector for the better part of the past decade. My experience and successes in the lithium sector have been in forging strategic relationships and partnerships with large multinational companies and stakeholders. 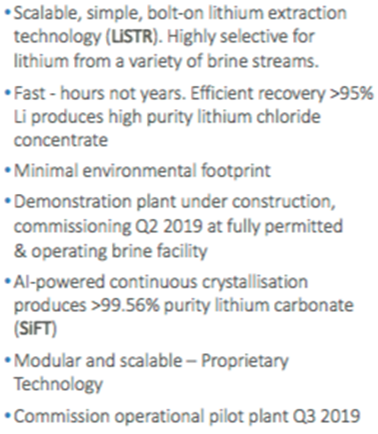 Previous to Standard Lithium, at Pure Energy I brought POSCO, Tenova Bateman, SRI and Tesla to the table; at Standard Lithium we have continued that dynamic with the agreements and partnerships executed including NYSE listed Tetra Technologies and, of course, our announced planned JV with LANXESS. Our non-executive chairman is Bob Cross. Bob is a company builder with a great pedigree in finance, mining, oil & gas. Bob is currently the chairman at B2Gold and was one of the early investors in Standard; he joined the board last summer. Andy Robinson has assembled our scientific-technical team, which includes several world-renowned professionals from a variety of industries, not your typical exploration mining geologists. From the pharma and fine chemical world, Professor Jason Hein is a recognized global expert on the development and commercial application of AI and robotics on reaction optimization. Prof. Barry Sharpless received the Nobel Prize for Chemistry in 2001 for his work on chirally catalysedoxidation reactions. Prof. Sharpless will receive the Priestley Medal, the American Chemical Society’s highest honor, in 2019. He discovered several chemical reactions that have transformed asymmetric synthesis from science fiction to the relatively routine. Craig Brown is a hydrometallurgical expert with over 45 years’ experience in developing processes for separating a wide range of chemicals from aqueous solutions. He was a central figure in the development and application of ion exchange technology, which is now well established and utilized in over 50 countries in dozens of different applications. Ross Lewis has over 45 years’ experience in process engineering, mechanical engineering, materials handling systems design, project management, procurement and construction in projects around the globe. Ross will manage the procurement and construction of the Pilot Plant. Dr. Ron Molnar is a chemical engineer and solvent and ion-exchange specialist with over 35 years’ experience in hydrometallurgical bench and pilot plant testing. He has successfully built and operated more than 60 pilot plants around the globe, extracting a wide range of metallic elements. How is your proprietary process different from lithium brine operations like those found in Argentina? First, I would like to state that the project drives the process. Every lithium brine project globally is by and large wholly unique. Not only the chemistry of the brine, when developing the process flow sheet, as a project builder you need to consider access to and cost of, chemical reagents, water, power. Permitting, extraction and re-injection of brine, access to land and a skilled workforce are fundamental considerations before you even begin bench-scale testing. Trying to force an extraction technology on a project is akin to the square peg round hole analogy. Going back to your question, our patent-pending selective extraction, technology, we call “LiSTR,” vis-a-vis a typical Argentine brine project that would use either solar evaporation ponds or a modified version of solar evaporation with ion exchange. As I mentioned, the project drives the process. A unique advantage in south Arkansas is access to large volumes of raw brine to process test. Unlike our peers, we can literally open a spigot and fill large IBCs or totes with brine and ship to our facility for process testing. We do not need to permit a well, or get extraction permits. This cut months off the development timeline and allowed us to test a number of existing extraction processes including, but not limited to: solvent extraction, a variety of ion exchange resins, nanofiltration, and flotation. Through this test work, we have developed a proprietary process that uses a solid ceramic adsorbent material with a crystal lattice that is capable of selectively pulling Li + ions from the waste brine after it has gone through the bromine-extraction step. The ceramic adsorbent materials are mounted in stirred-tank reactors that contain brine. In the second step, the adsorbent releases the Li + ions for recovery. Importantly, the Li-extraction process takes advantage of the fact that the brine leaves the bromine process heated to ~70°C. ­This means that no additional energy is required; the reaction kinetics for the adsorption is suitable. The process is capable of reducing the time required for Li extraction from many months (with the evaporation ponds) to hours, and is capable of producing a high-purity lithium chloride solution for further processing into battery quality compounds. The LiSTR process is designed to be scalable at each stage, from bench scalemini-pilot-demonstrationcommercial. We are using technologies and processes used in other industries; we are not reinventing the wheel, just turning it. How might your cap-ex compare to that of lithium brine projects? For instance, there are six projects at PEA-stage, or more advanced, with an average cap-ex of C$540 million. We have not published a PEA, so I cannot comment directly on cost comparisons other than pointing to the existing infrastructure at the project. The well-fields are in place and currently producing and circulating 125 million barrels of brine annually. The pipelines are in place, as is power and water. Road and rail are at the site. This is a bolt-on technology to existing chemical plants. How might your op-ex/tonne compare to that of lithium brine projects? Again, we have not yet published a PEA, but we are targeting the lowest quartile cost of production for lithium carbonate. We have confidence that this is achievable as the primary cost inputs are very attractive in south Arkansas, power and water are plentiful and inexpensive. Chemical reagents are produced in or shipped in close proximity to south Arkansas, the region is well connected to the Houston shipping channel. At the project level, we can leverage the buying power of a global chemical company when procuring materials and service agreements. Please describe who LANXESS is. In what ways (if any) is LANXESS already helping you? LANXESS is a global specialty chemical company based in Cologne, Germany. It operates 74 chemical plants around the world, 19,000 employees. 2017 revenue is around $11 billion. The company acquired Chemtura in 2017 for $2.57 billion, which included the Arkansas bromine business. 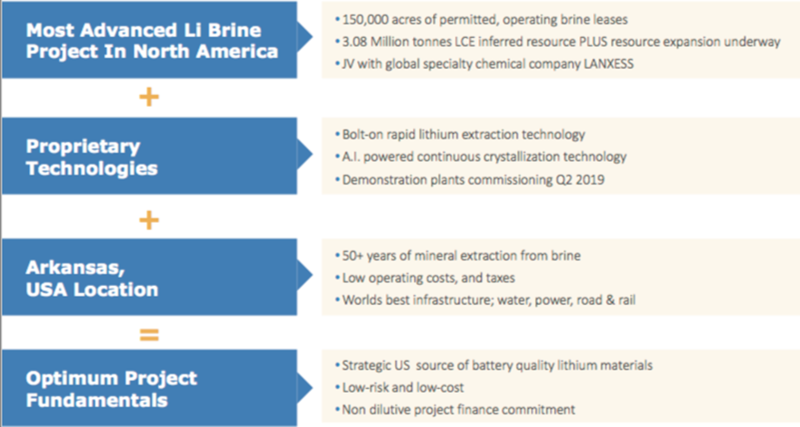 We have signed a binding MOU and a general term sheet for a planned JV with LANXESS for the phased development of the south Arkansas project with the goal of producing battery quality lithium materials on a mass scale from brine that is a by-product of existing bromine production facilities run by LANXESS and from 30,000 acres of undeveloped brine leases that Standard Lithium holds. As part of the binding MOU, we will locate and operate our pilot plant at one of LANXESS’ chemical plants in south Arkansas. We will connect the plant into its brine pipeline system, post bromine extraction, and demonstrate (on a continuous basis) our selective lithium extraction process. We will also be locating our AI-powered lithium carbonate crystallization pilot plant at the site in south Arkansas. The MOU we have struck with LANXESS allows us to leverage its massive infrastructure investment to de-risk our processing technology without having to spend tens of millions of dollars on resource development and the years of time that would entail. The planned JV with LANXESS includes a commitment from it for commercial project financing (subject to proof of concept and a positive PFS). That is a very important differentiator between Standard Lithium and our peers. In addition to LANXESS, you have been working with a number of other parties. Please explain. As a development company, managing the runway and executing on our business plan requires strategic planning. We have taken the stance that we can accomplish more and in a more cost-effective manner through strategic partnerships and agreements. In south Arkansas, we secured the only available large brine lease package with our agreement with NYSE listed Tetra Technologies. For our pilot plant development, we are working with two global brands, Salt Works Technologies in Richmond B.C. and Zeton in Burlington Ontario. For analytics and research, we are working with two professors from the fine chemical/pharma departments at the University of British Columbia. What’s the status of your pilot plant, and what are the next steps? Two pilot plants. We have two pilot plants in development. “LiSTR,” the selective extraction demonstration pilot plant is under construction in Burlington, Ontario. Zeton is a global leader in pilot plant construction. The plant will be shipped from Zeton to south Arkansas in Q2 of this year and will be located at LANXESS’ Southern Bromine Extraction plant. The site has virtually everything required to operate in place; steam, water, power and the demo plant will connect to the existing brine feed and disposal pipeline system. We intend to run this plant in a continuous operating state, not in a batch process. We expect to run the plant through Q3/4 of 2019 and Q1 of 2020. The results of this work will feed into a Feasibility study targeted to be completed in Q2 2020. The second pilot plant is our “SiFT” Lithium Carbonate Crystallisation Pilot Plant, which is being built by Saltworks Technologies Inc., at its facility in Richmond, British Columbia, Canada. The crystallisation technologies used today in the industry were developed in the mid-twentieth century and are suited for producing technical grade compounds. As higher and higher purity compounds are needed by cathode makers the industry needs to evolve. The SiFT process has been developed by Prof. Jason Hein at the University of British Columbia and introduces advances and technologies from the pharma and fine chemical world to the lithium battery material world. It integrates Artificial Intelligence (AI) enabled high-speed, multi-image photo-microscopy and computer image recognition for crystal size and shape that acts like an auto-pilot, continually monitoring and optimizing the process. We have an operating prototype pilot plant that we are currently testing. The next step is to build a demonstration-scale plant that we will ship to Arkansas in the Q3 of 2019. Most conventional brine projects are planned for about 20,00030,000 tonnes of Lithium Carbonate Equiv. (LCE)/year. Will your project be able to scale up to that range? Yes, that is an achievable production target based upon current commercial brine production volumes, with an expansion opportunity from our undeveloped brine leases. Please describe Standard Lithium’s near-term catalysts. The immediate near-term catalysts to watch for are a PEA in late Q1 or early Q2 and of course, our pilot plant(s) being moved to site and commissioned in the first half of this year. Investors can also expect further details on our strategic agreement with LANXESS. Thank you, Mr. Mintak, for a detailed review of Standard Lithium (TSX-V: SLL) / (OTCQB: STLHF). Readers should consider keeping an eye on this company for the near-term catalysts listed above. Disclosures: The content of this interview is for information only. Readers fully understand and agree that nothing contained herein, written by Peter Epstein of Epstein Research [ER], (together, [ER]) about Standard Lithium, including but not limited to, commentary, opinions, views, assumptions, reported facts, calculations, etc. is not to be considered implicit or explicit investment advice. Nothing contained herein is a recommendation or solicitation to buy or sell any security. [ER] is not responsible under any circumstances for investment actions taken by the reader. [ER] has never been, and is not currently, a registered or licensed financial advisor or broker/dealer, investment advisor, stockbroker, trader, money manager, compliance or legal officer, and does not perform market making activities. [ER] is not directly employed by any company, group, organization, party or person. The shares of Standard Lithium are highly speculative, not suitable for all investors. Readers understand and agree that investments in small cap stocks can result in a 100% loss of invested funds. It is assumed and agreed upon by readers that they will consult with their own licensed or registered financial advisors before making any investment decisions. At the time this interview was posted, Peter Epstein owned shares in Standard Lithium and it was an advertiser on [ER]. Readers understand and agree that they must conduct their own due diligence above and beyond reading this article. While the author believes he’s diligent in screening out companies that, for any reasons whatsoever, are unattractive investment opportunities, he cannot guarantee that his efforts will (or have been) successful. [ER] is not responsible for any perceived, or actual, errors including, but not limited to, commentary, opinions, views, assumptions, reported facts & financial calculations, or for the completeness of this article or future content. [ER] is not expected or required to subsequently follow or cover events & news, or write about any particular company or topic. [ER] is not an expert in any company, industry sector or investment topic. [ER] may buy or sell shares in Standard Lithium and other advertising companies at any time.